Join the many who are learning the ancient oriental art of bonsai through this practical and comprehensive course. Eight practical lessons cover the selection of plants suited to bonsai, understanding the history and classic shapes which form the basis of the art, techniques of planting, training, pruning, watering & feeding and ways of using bonsai both indoors and outdoors. You will create several bonsai of your own during the course and receive constructive criticism from your tutor as they help you develop your own personal bonsai style and techniques. Save yourself time and money by learning the correct techniques from the beginning. Included in this comprehensive course are eight lessons each with a set task and eight assignments designed to teach you a range of bonsai styles. It's been said that people either love cacti or hate them. 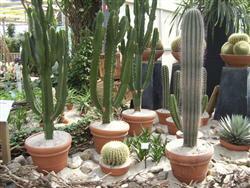 For lovers of cacti and succulents, this comprehensive 8 lesson course is a must. The course studies major cacti and succulent groups and the differences in how to treat plants from each; in terms of soils, feeding, watering, pruning, pest control, planting procedures and more. It will stimulate your interest, and set you on the path to becoming an expert with these unique plants. These fascinating plants provide entertainment and stimulation to the enthusiast. covers a range of cultivated carnivorous plants, paying particular attention to the Pitcher Plants (Nepenthes) and Sundews (Drosera). Nine lessons each with a set task and Nine Assignments. Many people love plants, others work with plants as a gardener, farmer, nurseryman or green keeper. Few stand out though as true "plantsmen". "An expert Plantsman (or woman) is a rare commodity, and for those of us who have worked a lifetime in this industry; we know that having the ability to identify and describe thousands of different plants, makes you highly employable across most sectors of horticulture"
Enrol today and get a free 20 hours self study course in Plant Taxonomy! Learn everything you ever wanted to know about fuchsias, from soil management and feeding to pruning and propagation. Discover how fuchsias are classified into several major groups, the characteristics of those groups and how/where to grow different types to achieve the best results. There is more to Geranium and Pelargoniums than meets the eye! These wonderful plants have been seen on our window boxes for hundreds of years and are a big part of many garden lovers lives. Learn ways to maintain them to optimum performance. Learn how to avoid problems that can be easily cured. Learn how to take your own cuttings, grow them successfully and discover how many different types there are to choose from. In this course you will also learn this basis of all good horticulture with plant health, understanding soils, plant nutrition, cultural requirements and pest and diesase treatment. Time to get those green thumbs working! Beautiful camellias require little attention, once established, and yet there is so much to know about them. This course is a wonderful way of learning about the different groups of camellias (eg. japonicas, sasanquas, reticulatas), their special characteristics, and their culture. Develops your understanding of soils, feeding, watering, pruning, planting methods, pest & disease control, propagation, & more. Improve your ability to identify different varieties (both common and uncommon), and how to use camellias to achieve desired landscape effects. This course is a natural progression from Horticulture 1, but can be taken as a subject in its own. It concentrates on the identification, care and use of plants in a systematic way. Plant knowledge learnt here is in high demand in the horticulture industry. It is something prioritized by employers, but all too often minimized in modern courses due to financial constraints. This is really something that EVERYONE who works with plants should study. Knowing what we teach here will help you make a lot more sense of plant names. This is different to our other 100 hour courses; being not only shorter and with a lower fee, but with the assessments at the end of each lesson being fully automated. Better understand how to choose an appropriate plant for any purpose you have in mind. Learn where and how to grow one of the most stunning groups of plants in the world. With the right cultural techniques (e.g. proper drainage, soil treatments, irrigation methods, feeding, pruning, weed control), you can achieve top quality, large blooms in what might otherwise be considered poor horticultural conditions.